I. Introduction Buying a lens for your new DSLR can turn out to be a more difficult decision than deciding which DSLR or brand to buy. For each system, there are dozens upon dozens of choices on the market ranging from a lowly $50 all the way up to a bank breaking $10,000+. 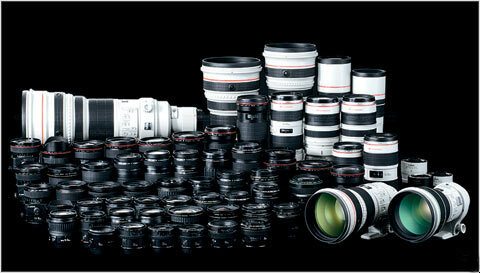 This guide will help you choose the right lens(es) given your needs and your budget. II. Figuring out Your Needs The first step towards buying a lens is asking yourself what kinds of subjects you shoot the most. That’s where the bulk of your investment needs to go initially. Ask yourself questions like the following… – Do I shoot indoors or outdoors? – Do I take pictures of closer things or farther things? – Do I take photos of fast moving objects (i.e. action, sports)? – Do I want to take portraits or do weddings? – Do I like hiking around to take pictures of wildlife and nature? – Am I into macro photography? – Do I take pictures of landscapes, interiors, and/or architecture? – Do I prefer more compact, convenient lenses or more bulky, inconvenient lenses that will help me take “better” pictures? These are the kinds of questions you need to ask yourself. Once you find out what your needs are, you need to decide what your budget is and how many lenses you plan to buy. If your lens budget is in the range of… Under $300 In this range, a solid 3rd party all-purpose lens will be your best bet. Hopefully, you won’t be in tricky situations like indoor sports, concerts or indoor venues where flash is prohibited. $300-$600 In this range, you have a little more room to work with. You still can’t afford a “premium” first-party (Canon/Nikon) lens, but you can comfortably buy a top-grade 3rd party lens with money to spare for a 50mm prime (for low light situations). Above $600 When you have a little more money to work with, you can start looking at entry-level premium lenses. However, these may not work for tricky situations like indoor, low-light photography. For those situations, you will want to look at lenses with large apertures of at least f/2.8. You may also want to opt for a prime instead. Either way, refrain from buying more than 2 lenses at the outset. Buy slowly and constantly evaluate what you need. You may end up changing your mind once you start shooting. Reminder! Whichever lens(es) you decide to purchase, be sure to actually try them out in the store before buying! Make sure you’re comfortable with the build of the lens as well as its weight. And most importantly, make sure that its optical quality meets your expectations. Bring along a memory card and see how the shots come out at home. There’s no way you can evaluate image quality through the preview LCD, even a 3.5″ one! III. What determines price? If you are looking at lenses and their prices for the first time, you may be quite bewildered at the pricing scheme. It may be counter intuitive at first to see that the lenses with the widest ranges (the highest “optical zoom”) tend to be the cheapest while the ones with the most restrictive ranges tend to be the most expensive. But once you understand how several key factors play into the final cost of a lens, you’ll understand why certain lenses can cost thousands while seemingly similar ones can cost only hundreds. There are two primary factors that determine the price of a lens. These are focal length and aperture. Focal Length The cheapest lenses are the ones that are easiest to make. The easiest lenses to make are those that are close to the 50mm mark*. The farther the focal length deviates from 50mm (percentage-wise), the more costly it will be. It is much trickier to design a 10mm or a 500mm lens than 50mm lens. Moreover, we must take into account the fact that most digital SLR’s use sensors whose area is smaller than that of 35mm film. This is where the crop factor originates and is why people commonly say to multiply a lenses focal length by 1.5x or 1.6x to get its true length. * Precisely speaking, the “normal” focal length is defined as the length of the diagonal dimension of the medium. For film this is approximately 43.2mm (24mm x 36mm). Calibrating this to 50mm is a simplification, so that we can make our calculations easier. (Comparison between a 50mm to a 1200mm lens) Aperture The bigger factor into cost is how large the aperture is. The larger the aperture is (indicated by a small f-number), the more costly a lens is. This is why two lenses with the same focal lengths can differ by $1000. Notice how the lenses with large apertures have huge, fat barrels while the small aperture lenses are skinny and compact. (Comparison between a small aperture and large aperture lens) There are other features that factor into the final cost such as build quality and the inclusion of ED (extra low dispersion) elements for reducing Chromatic Abberation (abbreviated CA and known as “purple fringing”). IV. How big an aperture do I need? Do I need IS? Bigger apertures are better, but they cost you a lot of extra money. Why do you need a bigger aperture anyways? There are several reasons for wanting a big aperture. Bigger apertures are most commonly used in situations where there’s poor lighting and if you cannot use flash. To take a picture, the camera will either need a bigger aperture or it will need to make the shutter speed slower to expose the shot properly. Using a larger ISO value (1600, 3200) will help too, but going too high may sometimes introduce unwanted noise into the picture. If you are handholding the shot in this situation, the need for a bigger aperture is that much more important because a slower shutter speed will lead to camera shake and blurriness. You will also need a bigger aperture when you want to blur the background in a shot. When you use a larger aperture, the depth of field becomes shallow, placing only closer things (to the focus point) in focus, leaving the rest out of focus, or blurred. Conversely, when you use a smaller aperture, the depth of field becomes deeper, making a larger part of the image in focus. Diaphragm Blades and “Bokeh” The other major factor when it comes to blurring the background is how many diaphragm blades there are. This affects the the “bokeh” (a Japanese word which literally means “blur”), describing how well a lens handles out of focus areas of an image. Having more blades (7-9) is better than having fewer (5). Bad bokeh can be characterized by the presence of distinct geometric shapes (like pentagons or hexagons) instead of smooth circles when certain elements are blurred out. Do I need IS? Image Stabilization (IS) is a technology that can reduce the need for a larger aperture if you are handholding shots in low light. In layman’s terms, it is a “virtual tripod.” In situations where you cannot bring along a tripod, IS can make a difference between a photo that’s a keeper and one that heads to the trash bin. In practice, IS will gain you about 2 full stops (3-4 for newer generation lenses), but your mileage will vary depending on how advanced the technology in the lens is and technique. To put things into context, I’ve heard of people who were able to handhold shots at shutter speeds of 1/4 sec! (Right – IS off, Left – IS on) Beware that IS does NOT help when the subject moves. While IS may still help you handhold the shot, you will still need a fast lens to obtain a faster shutter speed that will freeze the action. Like everything else, IS is a useful tool but is not a substitute for skill. You still need to hold your camera still and use proper technique. What apertures do I need? If you are doing available-light indoor photography, f/2.8 is the bare minimum. I recommend f/2.0 or larger. If you are doing indoor sports or action photography, f/2.0 and larger is virtually required, so you can get fast shutter speeds to freeze the action in addition to bumping up the ISO to 800 or 1600. If you are working in decent light (i.e. outdoors), f/4 will work just fine. If you work mostly outdoors in great lighting, f/5.6 and above will suffice. If you plan on bringing a monopod or a tripod to stabilize things, you can even get away with even smaller apertures. V. What is an extender? An extender is a special kind of lens which mounts itself between the main lens and your camera. As its name suggests, an extender increases the focal length of your lens by some set amount. At this moment, there are two kinds of extenders, 1.4x and 2.0x. As a quick example, if you have a 100mm lens, the 1.4x and 2.0x extenders will transform the focal length into 140mm and 200mm respectively. For this reason alone, extenders can be quite useful in extending the reach of your lenses at a relatively lowcostwhile taking less space. As always though, there’s a tradeoff when you gain convenience. You sacrifice image quality, and the lens becomes “slower.” Here’s an explanation for both points. 1) You might recall that f-stop is a simple ratio between the diameter of the aperture of the lens (how big the hole is) and the focal length of the lens. For example, a 50mm lens with a 25mm diameter has an f-stop value of 2, hence the f/2 branding. Naturally, this means then that doubling the focal length will double the f-stop value, causing you to lose TWO whole stops. Using a 1.4x extender makes you lose ONE stop. If the f-stop value gets too high, sometimes auto focus will no longer function. Check with your manufacturer for exact details. 2) Extenders also degrade image quality, especially if you use a 2x extender. Think of an extender as a magnifying glass for a moment. If an extender is a magnifying glass, all of the “faults” in a lens will effectively become that much more noticeable. For examples, images may be softer, be more distorted or may lack contrast. But this is the price you pay for convenience. I’m sure that most of us would be happy lugging around a 200mm lens with an extender rather than a 400mm lens and a tripod. To sum it up, extenders are useful tools for getting more utility out of your lens collection. I personally recommend buying a 1.4x converter as the degradation in speed and image quality is less noticeable in practice. If you start with a very good lens, you may not notice a difference at all! VI. How do I read MTF charts? (For the Adventurous) MTF stands for Modulation Transfer Function. You don’t need to understand what the heck that means to read an MTF chart. An MTF chart gives us a visual representation of how well a lens performs. It gives us a good idea of howcontrasty and sharp a lens is in laboratory testing. Here are two sample MTF charts from Canon. For simplicity, I have chosen 2 primes. The first chart is for the 135 f/2 L. The second chart is for the 50mm f/1.8. (Source: Canon USA) The vertical axis represents contrast, ranging from 0% to 100%. An ideal lens would take in 100% of the light, but that never happens in practice. So, the higher a line is, the more contrast the lens has, which is good. The horizontal axis represents the distance for a sample point from the center of the image in millimeters. It is typically the case that quality suffers as you move towards the edge, but that isn’t always true as you can see with the 135L. Ignore the dotted lines for a moment. The black lines represent the lens performance wide-open. The bluelinesrepresent its performance at f/8. Obviously, stopping a lens down will result in better contrast and sharpness. The best lenses will differ little when stopped down, meaning they can be used wide-open! This means you want theblack and blue lines to be as close to each other as possible as you can see once again with the 135L. If you look carefully, you’ll notice that for each pair of lines (black and blue), there is a thicker line and a thinner line. The thick line tells you specifically about contrast while the thin line tells you specifically about sharpness. Finally, what do the dotted lines represent? Rather than go into the technical jargon of what they are, you are looking for these lines to be close to each other. They represent the quality of the “bokeh.” MTF charts shouldn’t be taken as the ultimate word on everything as they are yet just another bunch of numbers, but they are usually pretty accurate. Their weakness though is that they don’t reveal everything about a lens. BOTTOM LINE: A good MTF chart doesn’t necessarily lead to great performance in real world photos and vice-versa.